Personally as a US Soccer grassroots instructor I feel more is learned in the in-person (face-to-face) courses. The Technical Director for US Youth Soccer Sam Snow was recently interviewed about “What is Working and What Needs to Change” in Youth Soccer Today for Goal Nation. The cost for coaching licenses is being reduced for the new grassroots modules. Gone are the “F” and “E” coaching licenses that US Soccer used to teach. 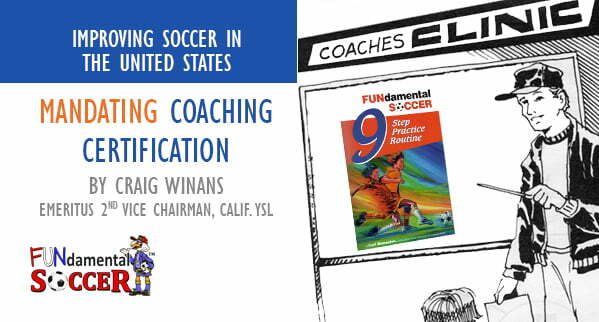 Instructors will be teaching a new format in these grassroots licenses of Play-Practice-Play. The modules will be based on the age the coach is coaching. These new modules will be either a 2 hour online or a 4 hour in- person course. Personally as a US Soccer grassroots instructor I feel more is learned in the in person (face-to-face) courses. Even that did not seem long enough. With the courses now moving to just 2 or 4 hours … Why would we not want to require that a coach spend this small amount of time learning the basics of how to coach face-to-face? In my 23 years of being a coaching instructor even coaches with extensive playing and coaching experience leave a course saying “Wow, I learned so much”.